Since early 2009 I created a method of make Google Street view without Tripod, I’m able to take a panorama shoot in a short time.It can be taken anywhere, so I took hundreds of thousands of panos, I show these panos by Street View function in Google Earth then. But not too long, At the end of 2010 Google Earth 6.0 removed these functions of custom street view, so you can only show each individual pano now. It becomes more difficult to use, and I had to say goodbye to my crazy days of “be a rotating streetview man”. 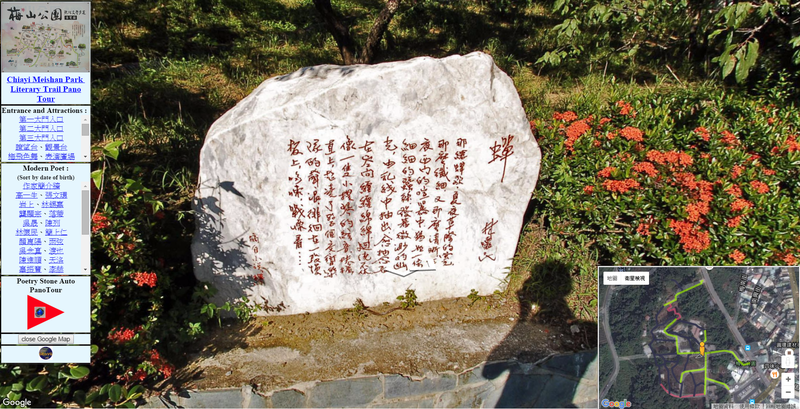 There are 32 stones scattered beside Meishan park trails.Every single stone has a piece of poetry by different local poets engraved on it, according to their birth order. I arrange the sequence of my panos by the birth order of the poets in my tour. There is a Lake called “Drunkenmoon” in National Taiwan University campus.In addition to the 700 panos I took in the range of about 0.1 square km which can be navigated by Google streetview, I also designed an “8” shape along Lake trail panotour. This entry was posted in Street View. Bookmark the permalink.